Are Fitness Trackers Actually Making Us Healthier? The rise in wearables can be attributed to many factors; from their perceived encouragement of healthy behaviors, their ability to track your progress and give a real time idea of how you are doing, to their broader impact in Healthcare. Others, are excited simply by the idea of being able to measure what only doctors used to be able to measure. The individual now has daily knowledge about the “workings of [their] own bodies” (David Pogue, Fitness Trackers Are Everywhere, but Do They Work? ), knowledge they used to only gather once a year through physicals. However, studies have found these devices aren’t very accurate. In addition, every single device was off by an average of 10 beats per minute, in every single test for heart rate. A couple of steps may not be a huge deal, but there is a big difference between a resting heart rate of 60 bpm and 70 bpm. If you’re purchasing this device to know exact measurements of your body, you’re out of luck, but if you have a fitness tracker for the reason the majority of the population does, all that you really need out of it is consistency. Unfortunately, again, this may not be so. There isn’t much data to support that those that own or use fitness trackers are healthier. 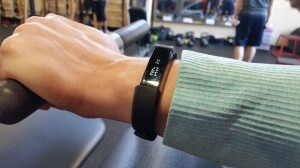 A study at the University of Pittsburgh, involving 470 participants, ages 18-35, found that those using a fitness tracker lost significantly less weight. Those in the control group lost an average of 13 pounds, while those in the experimental group lost an average of 7.7 pounds. Yet, another study involving 51 overweight postmenopausal women, getting an average of 33 minutes of activity a week, did see some increased physical activity when they wore a Fitbit. The 51 were divided into two groups. One group received standard pedometers and the other a Fitbit, an instructional session, and a follow up call after four weeks. The pedometer group did not have a significant increase while the experimental group increased activity by 38 minutes a week. The goal had been at least a total of 150 minutes a week, so neither group hit the goal. The differences in studies shows the effects of fitness trackers to be inconclusive in motivating people to be active or to lose weight. The difference in outcomes could be due to participants, sample size or duration of the study. There are other downsides to fitness trackers to be considered. For instance, these devices are tracking everything from activity to sleep cycles. This amounts to millions of bits of data and makes one question who owns the information and has access to it. Some in the medical community feel it is a waste of data to not be actively using it for research. There is also a feeling from some that these devices complicate life, adding stress and pressure to reach goals. Of 200 female Fitbit users, 89% did believe it made them healthier by walking more, eating more and by giving them a “pat on the back”. But, at the same time, 45% of those users said it made them feel naked, 30% said it made them feel guilty when they wouldn’t hit their goals and 79% said they felt under pressure to reach goals. All in all, if you’re considering a purchase, understand the true use of the product and what you’ll get from it. And that may not be exact numbers, or lost weight. “The major disadvantage of the devices, says Cadmus-Bertram, is that “sometimes people expect too much from them. The tracker is there to keep you honest and help motivate you. It cannot exercise for you, nor can it motivate an otherwise unmotivated person,”” Amy Fleming, Fitness Trackers: Healthy Little Helpers or No-good Gadgets? For some, having these devices makes them feel like they are more motivated and that’s all that matters. And maybe it has gotten you personally to keep active. RCSC member, Katrina Kimpel, has had her Fitbit for 3 years and says it keeps her motivated and moving, especially at the office. She also likes the challenge to get steps in. “It keeps me from getting out of control during the holidays as I stay more focused on my diet and keep moving,” Katrina says. If you strongly believe you’re that kind of person, don’t let this blog sway you, but, make sure you get the best in the market! In a study that looked at three different types of trackers–basic fitness trackers, heart rate monitoring devices and heart rate monitoring trackers with GPS—10 of the top referenced trackers were tested. The results showed the Garmin Vivi Fit 3 as the best contender, and the Fitbit Charge as a close second. All 10 trackers tested had wireless syncing, activity notifications, water resistancy, minimum one year warranties, and unisex designs. However, if you’re looking for consistency, the Tom Tom Spark 3 is for you. Maybe you love the tracker you already have and won’t give it up for the world. Maybe you enjoy watching your steps and celebrating when you hit 10,000. Maybe you haven’t used yours and realize you don’t need it to be motivated. Maybe you just received one as a holiday gift! Just don’t expect too much from them and Fitbits and Smartwatches can still be a lot of fun.